Small and elegant with labeling place, life LED indicator, broadcast address button. Can be used in any location that require energy saving, intelligent control such as Factory, apartment, Villa, Offices, Restaurant, Hotel rooms , Convention Center, Shopping Mall, Residential Building, Banquet Room, Stadium, Airport, Theme Park, Gymnasium, , Smart Mansion. rated at 16A each output ch. Q. Do we have to de-rate because of Spark effect when we design electrical digial Relays control panels DRP or Dimmer Panels DDP? Q. How does a relay work? A. Relay is an electromagnetic device, within which an electro magnet (sometimes called a motor) is fixtured to cause controlled movement either by magnetic attraction or magnetic repulsion. Other hardware attached to the moving magnetic portion of the motor such as relay contacts will cause switching of electrical circuits. Q. Why use a relay vs a circuit breaker or switch? A. RELAY is An electromagnetic device for remote or automatic control that is actuated by variations in conditions of an electric circuit and which, in turn, operates other devices (such as switches) in the same or a different circuit. Q. What is CIRCUIT BREAKER? A. it is s switch that automatically interrupts an electric circuit under an infrequent abnormal condition; e.g., a fault condition such as an overload or rupture of either high voltage or high current or both. Q. What is a SWITCH? A. Switch is A device for making, breaking, or changing the connections in an electrical circuit. Usually mechanical and operated by hand. Q. What happen if we put big power supply more than 2A/24VDC ( Note: In Clipsal Schneider case, we damage network if we do that.) so will that also similarly damage the dimmers in smart bus case? A. No, there is no harm at all, the S.BUS is designed with high flexibility and good amount of protection. You can add big power supply as you like, in example 30A/24VDC for even bigger Amp. to one dimmer or relay with only one switch.. the s.bus will still function perfectly. Smart-BUS is designed way differently compared to other manufacturers. Q. What is the maximum voltage that the smartbus can take before it burns its chip? Q. What happen to the bus chip if all the wires of the bus Are shorted? A. Mostly nothing because s-bus is protected, and once the short circuit issue is resolved then sbus should function normally. Q. Can we use electric cables instead of data cables to communicate between bus in case we have no data cables? A. Yes, you can use any conductor cable which is brass, that should work fine. Q. How long the Smart-BUS wire can be? Q. Does every S-BUS relays have scenes built into the module, or we have to buy scene controller? A. 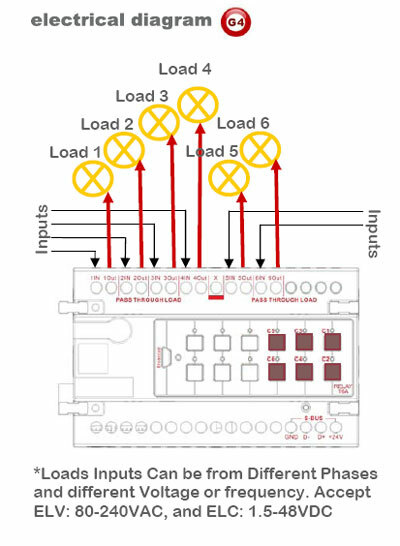 No need to buy any extra modules, each relay has scene and sequence function built in. Smart-Group always adds all needed features as possible inside same module to help save money, time, space and environment. Q. 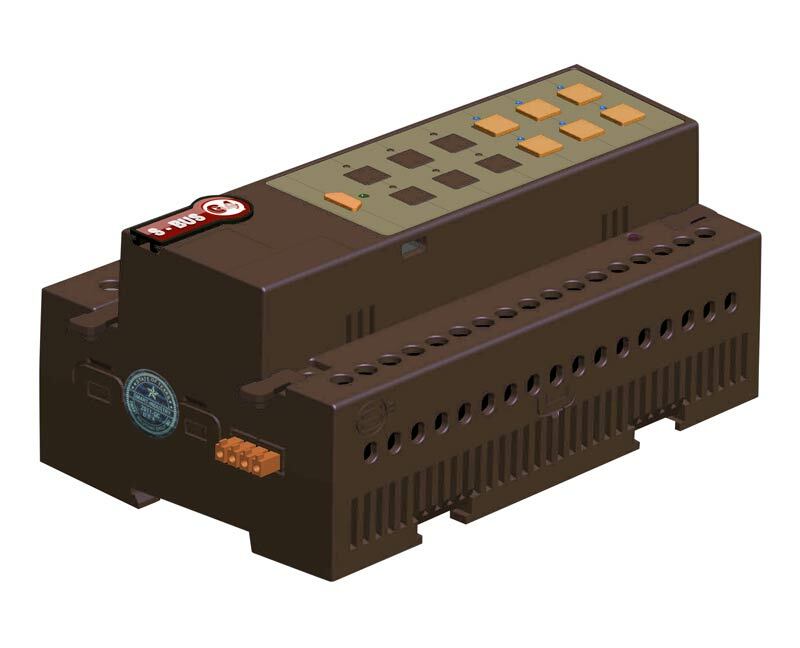 How many relays can be connected with the Train connecter that is built in the relay Module? A. from experiment, we had no limitation; you can connect as many as you can inside the DP on Single DIN-rail. 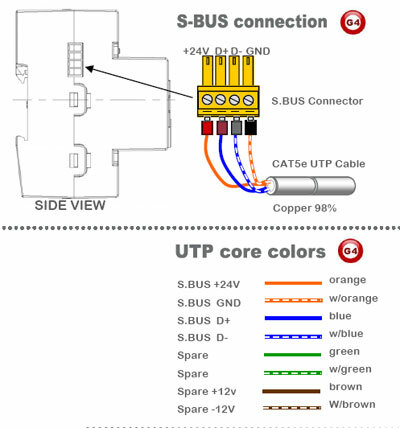 In case you have multiple Din-Rails, please bridge using side S-BUS Connector. A. In Smart-BUS case, the recommended working voltage is 24VDC, there is tolerance between 10-32 volts with perfect operation. If voltage drop below 8VDC then communication might be lost, and if voltage exceeds 45VDC then also S-BUS network ports will burn. When we designed the smartHome-BUS, we made it as bullet proof as possible with maximum voltage change flexibility imaginable at any normal case. Q. What is radio frequency interference (RFI)? A. RFI is a buzzing noise that may occur in some audio and radio equipment when solid-state dimmers are used nearby. Although every Smart-Bus dimmer contains a filter to suppress RFI, additional filtering may be required in some applications. Typical examples of RFI-sensitive equipment are AM radios, stereo sound systems, broadcasting equipment, intercom systems, public address systems, and wireless telephones. Q. Doesn't turning the lights on and off so quickly decrease bulb life? A. No. Switching the bulb does not decrease bulb life; heat decreases bulb life. By reducing heat, bulb life is increased.